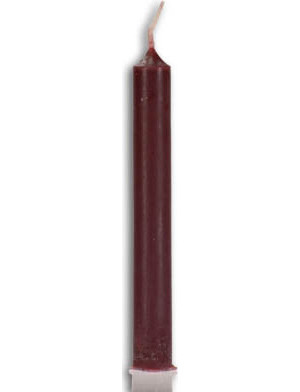 Corresponding with the element Earth this ruddy brown candle has a red tinge. Brown is associated with new beginnings, grounding, regeneration, and foundation strengthening, as well as construction, real estate, house blessings, animals, and fruitfulness. Anoint a brown candle with sandalwood oil to help raise one's spiritual vibrations while increasing protection and strength within the home. This is a single box of 20 chime sized candles 1/2 of an inch by 4 inches in length.